It's been awhile. Not that I haven't been cooking, I just haven't done much in the way of photographing what I cook. I fell off the regular blog updating wagon after a major snowstorm in October that knocked out power to parts of my state for over a week and cancelled/postponed Halloween. Then stupid daylight savings time kicked in. Curses! It gets dark around 4:30 in the afternoon which doesn't give me much available light. Guess it's time to break out the artificial lighting and beat the ol' seasonal affective disorder in the process. 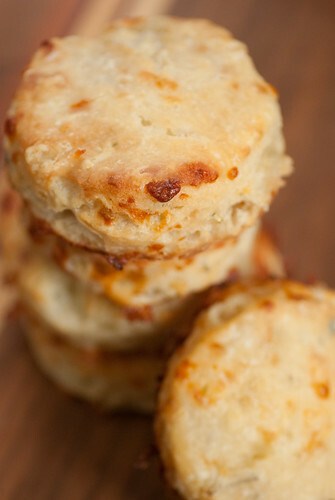 I hope to update with a few seasonal yummies soon, but in the meantime these are one of my favorite recipes for super flaky, cheesy, scrumptious biscuits. I love making biscuits because they're so easy to throw together, but satisfying like a warm loaf of bread. These are great as a holiday side or just to whip up beside a nice bowl of soup on a chilly evening. The key is to not overwork the dough. Fold/knead the dough only until it just holds together in a solid mass, and hold yourself back from adding extra liquid unless totally necessary. 1. Preheat oven to 425. Combine the flour, baking powder, sugar and salt in a medium bowl. Using a pastry cutter or your fingers (alternatively, you can use a food processor if you have one) cut in the butter until a coarse meal forms. Add the cheese and toss to incorporate. Stir in the buttermilk slowly, just until all the flour is moistened and the crumbs hold together if you pinch a bit between your fingers. You may use less than the 3/4 cup of buttermilk to achieve this. 2. Turn the dough out onto a lightly floured surface. Knead by folding the mixture over itself in half and flattening. Repeat 5-10 times, or until it holds together in a fairly solid mass. Pat into a 1 inch thick round and cut into biscuits using a 2 to 2 1/2 inch biscuit cutter. Any excess dough can be folded back together and cut into additional biscuits. Place biscuits about 1 inch apart on an ungreased baking sheet and bake in the preheated oven for 14-18 minutes, or until golden brown. Best eaten fresh and warm with a good schmear of butter! 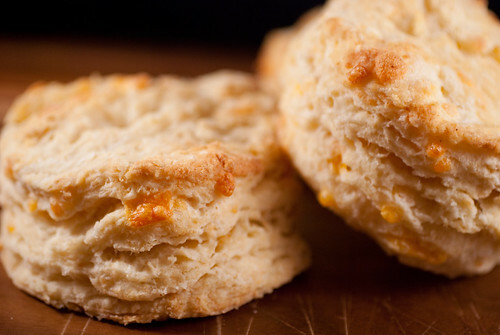 Love buttermilk biscuits, and the addition of cheddar must make them even better! Happy and delicious 2012 to you, Morgan! My daughter loves biscuits and cheddar, the combination in a biscuit must taste heavenly!! !